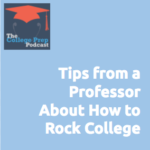 Listen in to a college professor talk about what skills make for a successful college student! What is a Freshman Seminar, and why might you want to look for a college that has them? What do the most successful first-year students do? Conversely, what are common problems that first-year students encounter? What can students do while in high school to prep for what college is “really like”? How can parents, teachers, coaches help support that? What do leadership experiences in high school get you (besides an impressive addition to your college application!)? Note: During this episode, Tina refers to the following resource: High Impact Educational Practices. Check it out! Tina Kruse is an Educational Psychologist (Ph.D.) with 15 years of experience teaching undergraduates. Her research is on the benefits of youth leadership experiences, with a forthcoming book on this topic (Oxford University Press, 2018). In addition to her long-term teaching and advising at a liberal arts college (Macalester College in St. Paul MN), she also offers private, one-on-one academic coaching to students ranging from high-school to graduate school. Recently she’s been charged with starting a campus-wide plan to support her college’s students to integrate better their learning settings–helping them connect the classroom efforts with their off-campus experiences such as internships and study abroad. You can find out more about Tina’s work at www.tinakruse.com. Please Note: In this podcast recording Tina Kruse is representing her work as described at www.tinakruse.com and is not representing Macalester College. Listen in to Megan and Gretchen with guest speaker Tina Kruse as they discuss how to Rock College and be a successful college student! Parents, Do You Go Crazy Checking Your Kid’s Grades?